I assume this is what economists mean when they say that something unexpected such as a terrorist attack would cause them to re-evaluate their stock market forecasts. At least, I doubt they mean that a terrorist attack would cause them to revise their estimates upward. It seems logical that a scary, destructive terrorist attack, particularly one that implies more attacks to come, would be bearish for stock prices. Take a moment to study Figure 17. Surely all of these exceptionally dramatic swings in the DJIA must have been caused by equally dramatic news: bad news at each of the peaks and good news at each of the bottoms. At least that's what the exogenous-cause model would have us believe. As it happens, there was indeed a lot of dramatic news during this time. For one thing, there were surprise terrorist attacks on U.S. soil, first the "9/11" attack on the World Trade Center and the Pentagon and secondly the slew of mailings of deadly anthrax bacteria, which killed several people, prompted Congress to evacuate a session, and caused havoc lasting months. Where on the graph of stock prices would you guess all these events have happened? If you guessed "six trading days from a major bottom and all through a six-month rally," you would be correct. But if you are an exogenous-cause advocate, you would not have made that guess. Figure 18 notes these occurrences. The 9/11 attack occurred more than halfway through a dramatic price decline and only six trading days from its end. Afterward, despite deep concerns that more such attacks were in the works, the stock market rallied for six months. The first anthrax attack occurred on the very day of the low for the year, and the attacks, deaths and scares continued throughout the strongest rally on the entire graph. To put it more starkly, the market bottomed when they started and topped out as soon as people realized they were over. If one were to insist upon a causal relationship, one would be forced to conclude that anthrax attacks are bullish for the stock market. This kind of perverse conclusion is what we invariably reach when examining an exogenous-cause case along with actual data pertaining to it. This is why economists after World War II (see Figure 12 in Part VII) decided that wars were good for the economy. Figure 18 has similar implications for public policy. Should we encourage crazed people to send deadly packages in order to get the stock market to go up? This idea is no dumber than advocating war to get the economy rolling. But the evidence for it is right there, just as it was for the supposed "oil shock" of 1973. We have uncovered at least one irrefutable fact: Terrorist attacks do not make the stock market go down. The assumption behind economists' repeated implications that terrorist attacks would constitute an "exogenous shock" that would serve to drive down stock prices is shown to be completely wrong. Apparently political events and conditions, like economic events and conditions, have no consistent causal relationship to the rise and fall of stock prices. "There is a surprisingly small effect [from] big news [of] political developments...and international events." That is indeed the case. But it is "surprising" only to devotees of the exogenous-cause paradigm, which means virtually everyone. Proponents of socionomic causality and the Elliott wave model of financial price change are not surprised in the least. This article was syndicated by Elliott Wave International and was originally published under the headline Don't Get Ruined by These 10 Popular Investment Myths (Part VIII). EWI is the world's largest market forecasting firm. Its staff of full-time analysts led by Chartered Market Technician Robert Prechter provides 24-hour-a-day market analysis to institutional and private investors around the world. The rout in stocks is no "jinx"
"The abundance of investor confidence needed to get Alibaba's record $25 billion initial public offering off the ground was but one of several red flags that made the market feel top heavy." "Calling a top based on a big I.P.O. is probably the weakest argument the bears have made so far... While the market isn't cheap, corporate earnings are still growing solidly, which should keep the bull alive." Again, this explanation doesn't make sense, considering the fact that the Ebola crisis has been front and center in the news since the first outbreak was reported seven months ago -- on March 19, 2014. The first 3 American victims of the virus were flown into the United States from Liberia in early August, to receive treatment at the Centers for Disease Control in Atlanta, Georgia. Jinx, as in coming from the Greek word "iynx," bird used in black magic. At the end of the day, every single one of these efforts to explain the stock market rout occur after the fact -- AFTER the Dow has already plummeted over 1000 points from its September 19 peak. 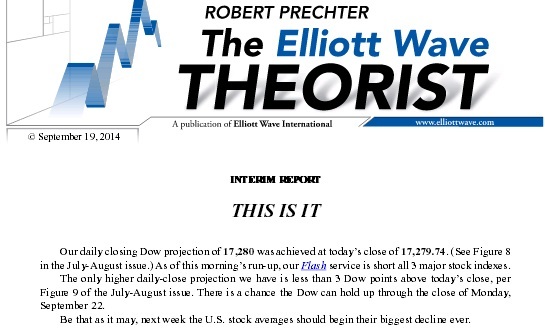 "Our daily closing Dow projection of 17,280 was achieved today." "Our Flash service is short all three stock indexes." "Next week, the U.S. stock averages should decline." Once the market began to plummet, our October 10 Short Term Update showed subscribers 2 more objective technical reasons for the reversal. 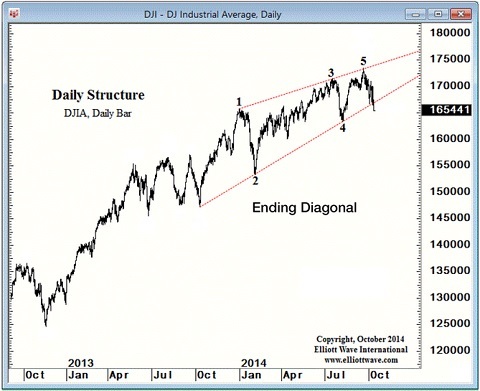 "It's now been one full year since October 9, 2013, the date that the Dow's fifth-wave ending diagonal [Elliott wave pattern] started." "October 9, 2013 marks the start of the trendline that would eventually form the baseline of the diagonal, as shown on the daily chart. The market is signaling that this line is valid and important, as there have been six separate touch points over the past year. "We've often said that trendlines are a meaningful facet of market analysis because we don't draw them, the market does. All we do is connect the points on the charts to show what the market thinks is significant. 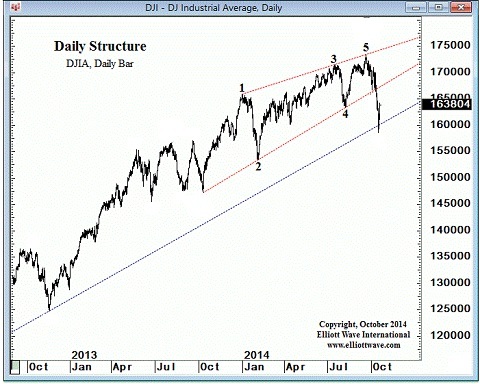 "Today, for the first time in a year, the Dow closed below the trendline, providing another key piece of technical evidence that the wave structure of the prior advance is complete." Fundamental analysis cites Alibaba, Ebola, and/or a magic "Jinx" as the cause(s) for the market sell-off -- after the fact. Elliott wave analysis cited an important Fibonacci price target, a mature Elliott wave pattern, and a meaningful trendline as the causes -- in advance. Moving forward, the choice of how you protect your financial future is yours. Read Our Newest Free Report: "This Is It"
It's times like these when investors like you need to maintain a focus on the coming bear market that will take far too many by surprise. As Bob Prechter says, "bear markets move fast and are intensely emotional; investors and traders who are prepared have greater opportunities on the downside than on the upside." In this new report, you'll read some of the recent analysis Bob Prechter and Chief Market Analyst Steve Hochberg wrote before the late-September turn -- and some of what they have written since then. This article was syndicated by Elliott Wave International and was originally published under the headline Want to Know the REAL Reason Why the Stock Market Turned Down?. EWI is the world's largest market forecasting firm. Its staff of full-time analysts led by Chartered Market Technician Robert Prechter provides 24-hour-a-day market analysis to institutional and private investors around the world.